What Other Task Can You Think of That Takes Less Than Five Minutes? Clean air in your home is important because it promotes better health. Nobody wants to be coughing and sneezing – especially if it is preventable by simply replacing your home’s air filters! How long has it been since you changed the air filters in your home? The Atlanta Home Inspection team suggests that you set up a schedule for replacing your air filters. By setting a schedule that coincides with other home maintenance you are more likely to remember the task. By replacing them at least once every three months, you will benefit. 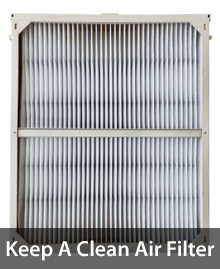 If you have pets or your home is in a dusty region then a monthly filter change might be more beneficial. Trapping and removing dust particles from the air you are breathing and replacing it with clean air circulation is the job of an air filter. Changing air filters is among the easier do-it-yourself chores. What other task can you think of that takes less than five minutes? The secondary benefit of doing it is that new filters help keep your HVAC unit in tip-top shape.